Shed dimensions to the right of this page. Set of shelves suitable for the Centurion, Trojan, Classic and Compact units.SORRY - THIS ITEM NO LONGER AVAILABLE! Fit in the Gladiator, Centurion, and Motorcycle sheds- clip to the inside of the unit. Ideal for hanging very heavy items out of reach of children, or for keeping delicate items off the floor. Benefits Of the Asgard Centurion Plus 1 large metal shed 5x11 ? Integral metal base for extra security. 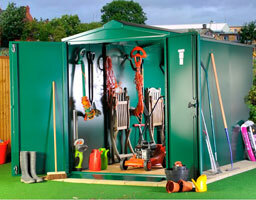 Reinforced hinges, panels and doors - a very secure, heavy duty metal shed. Suitable for garden use, allotments or commercial use. A great range of accessories available.